I had never heard to Eshakti before, but it's a really unique women's apparel site that allows custom changes of their garments - you can make adjustments to sleeves, length, etc. Sizes range from 0-26W and shipping takes place within 5 days, even with custom orders. The name 'Shakti' means power in Sanskrit, so Eshakti means the power of the net. The power, in this case, resides in the buyer, who can order clothes to fit specific needs. In addition, many of the items on Shakti are embellished by print, embroidery, and fabric texturing. I loved how so many of their styles were classic and timeless. They have so many dresses to choose from (and a wonderful assortment of shirts as well). 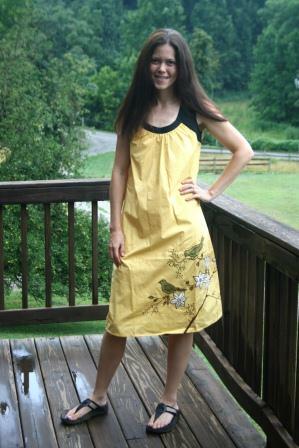 I picked the Sunny Garden Shift Dress, because I loved the details of the birds, and the golden yellow color. I absolutely love the dress itself, however, it is cut way too large for me. I normally wear a size 4 in dresses (and a 6 in clothes) but according to the sizing charts on the site, I needed to order a 6. Which is what I did, but I was swimming in this. I held the side of the dress in this picture so you could get an idea of how it would've fit if I'd ordered the proper size. Granted, it's a shift dress, so it's supposed to be roomy, but in my case I had an extra foot of room. At any rate, I think the dress itself is adorable and I'm hoping my mom can take it in a little for me so that I can enjoy wearing it. I love how versatile and casual this dress is, and I found it very comfortable on. So bottom line - really cool site, beautiful dresses of all styles to choose from, and wonderful unique ideas. If you're on the fence about sizing, go ahead and choose a size down, because their sizes may run large, depending on style. If you like what you see, you can follow Eshakti on Facebook and Twitter too! Disclaimer: I received one item from Eshakti of my choice for review purposes. The opinions stated above are my own. That dress looks really cute on you. I will look at it, but taking it in may not work well with that artwork. However, I am thinking that you could cinch it up with a belt and it would be even more adorable. Did you try that? I have never seen you wear yellow before. It's a nice color on you. I love the dress. Will they exchange it for you? Maybe a mitten clip would work in the back. I just ordered my 2nd dress from there last week and I'm wearing the first to a wedding tonight. The first dress fits like a glove. For the first time ever I was happy with a dress and I actually look good in it. It's cut perfectly and it just makes me so happy. I have wide shoulders so nothing really fights right on both the top and bottom but this is perfect and ithey will definately be my go to choice for dresses in the future. My next purchace from there is going to be a top....but how do you choose??? Very cute dress! But yes...way to big. I like the belt idea if your Mom can't take it in. Yellow is certainly your color. I have a granddaughter that looks great in yellow too. I think Cat is right, a belt might look really cute with that. That is really cute the colour is perfect for you. I hope your Mom can fit it better. It really is a cute summer dress and wonderful on these sticky, hot and humid days we have been experiencing... I hope it can be taken in too so it fits the way it should... Let us know! Cute dress, not sure where your holding in it but it doesn't look big in this picture :O). Maybe a belt like the above comment said :O) would work for ya. I hope your mom can do a little sewing magic on it for you so that you can wear it comfortably. It's a cute dress design though! That is a cute dress! I will have to check out their site. Beautiful dress--it looks really good on you! I love the stitching of the birds. I'm going to check out the website. The most frustrating part about ordering clothes online is figuring out what size to get. It seems like such a gamble sometimes, and it would be nice for companies such as Eshakti to be more accurate-I would feel more confident ordering from them then. If this dress is machine wash and dry any chance it might shrink some in the dryer? OOOh, I think we should him it so that it falls at the top of your knees. It would be really cute short and you have those runner's legs!!! Aw, you look adorable. I hope you can find a solution so you'll be more comfortable. I didn't know that shifts were back in style. I used to love them. I'll check it out. Cute jumper. That's a fun find. I may be able to select for my choices. Sounds worth a look. I think you could easily belt in that shift dress , or throw it over a top or something during the Fall. It is a very cute dress, but even with you holding it I can tell you are swimming in it. Oh to swim in a size 6 again! I hope you were able to return for a size smaller and it is a cute dress. I really like ethnic type clothes but it's so hard...impossible...to find sewing patterns. It does look like a really sweet dress and the color suites you! That's why I hate ordering clothes online. Even clothes I eye in the store don't fit as I envision them when I go in the dressing room. Hopefully your mom can alter it to fit you better. Cute design. I have a niece that is so tiny she can never get things small enough. On shifts like this she will sew a casing around the inside waist and run elastic in it to gather in the waist. When she shortens something she saves the part of the hem she cuts off and makes belts out of the fabric. She either uses velcro to attach the ends together and sews on a cute button or attaches a small brooch or decorative pen. Or she sews on the button and cuts our a button hole. Perhaps one of these would work for you. What a fun site and I adore the dress you chose. Dresses or much cooler for these hot summer days. hahaha - you crack me up! Oh the dress is adorable and look so cool on you! I love that dress and of course not surprisingly it looks great on you! One of my favourite authors in my early 20's was Shakti Gawain. I immediately felt warm to the name.